Some time ago Brian Cook (Russian Circles, SUMAC, These Arms Are Snakes) tweeted a statement that has stuck with me regarding Helms Alee. “Your favorite band’s favorite band”. 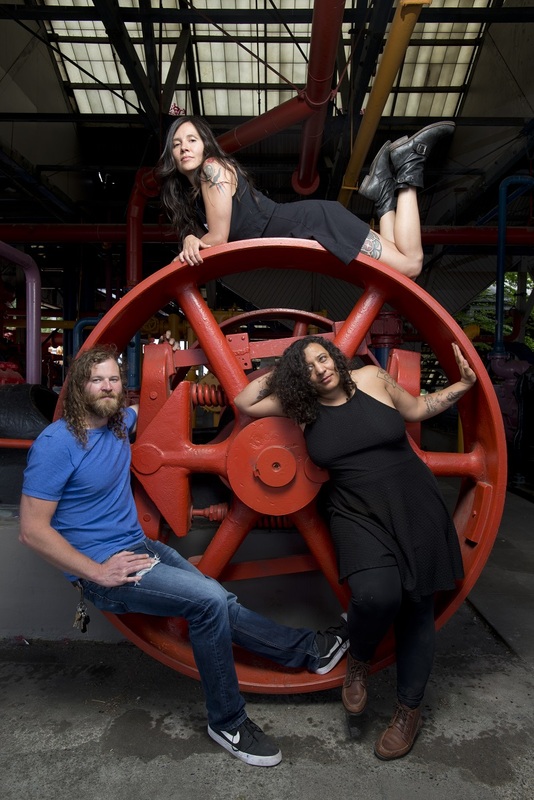 This three piece from Seattle/Tacoma have always seemed to win the praise of musicians and is beloved by the rock-n-roll loving inhabitants of the Pacific Northwest. With their most recent release on Sargent House, Stillicide, I think it is safe to say that they will become the favorite band of many people across the globe. Stillicide as a whole is perfect. The grandiose piano introduction “More Weight” leads the listener into certain stormy weather, but piles on heaps of confidence. Don’t worry, you got this. Wicked guitar tones, crunchy bass and relentless drums make your mind-ship unsinkable. The twists and turns throughout the listening experience culminate in a rousing finish with “Worth Your Wild”. It is the sort of finish that has the listener standing in the crow’s nest screaming “is that all you got? !” into the fury of rain and winds while the ship is surely destined to be swallowed by the tumultuous sea. A wild ride indeed. What sets Stillicide apart from the rest of the amazing Helms Alee albums is the use of their vocals. It is well documented that Dana James, Ben Verellen, and Hozi Matheson-margullis all have wicked vocal chops. With their previous albums it usually seemed that a certain delivery was the theme for the album. With Stillicide they found the perfect mixture and dose for all of their skills. Ben shows off his gnarly growl and at other times flashes his beautiful clean singing voice. Hozi and Dana take turns on lending their dreamy sounds and other moments combine for an almost tribal chant. Then there is that harmony. Some songs even have a collective showcase of all of their vocal abilities. In baseball, successful pitchers are able to fool the batter by changing eye level. That may result from arm angles, pitch location or speed changes. These result in keeping the batter off balance. If Helms Alee were a pitcher they would be very difficult to hit. They will keep the listener on their toes leaving them wondering what is going to come next. So go buy this record. Just beware of the Jumanji effect. When you get this puppy in your arms strange things will happen. It can sense when it is getting close to your record player. When you get on your street you will hear the growing drums and wailing guitar from the beginning of “Meats and Milks”. The wind will start to pick up. You get inside and there will be strong odor of the ocean. Come around the corner and you will be surprised to see a pool of water that is a result of dripping water coming out of the sides of your speakers. The only way to get things back to normal is to play the record in full. I hope you brought your floaties! This is a powerful record.